Like the rules of cricket, but even more so; explaining the quintessentially British affair known as ‘Panto’ to the uninitiated usually meets with an expression of wide-eyed alarm and amused confusion. But let’s take this one step further. 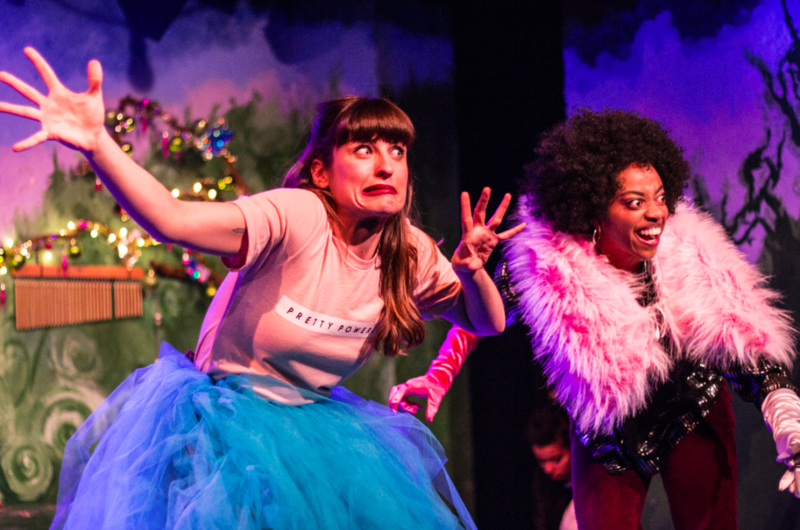 Explaining the rules of ‘The Sleeping Trees’ – the company that have brought “Cinderella and the Beanstalk” to Theatre 503 this Christmas – is a complete non-starter. You think you know Panto? Oh no you don’t! The first thing you read in the promo material about this show is that ‘The Sleeping Trees’ are not performing. The award winning, three-piece, comedy trio are far too busy doing other stuff. They’ve done it before anyway. So, they’ve booked a forty-strong cast and musicians this year. Maybe it’s because of the slightly early start time of 7pm, but we’re perilously close to ‘beginners’ and there is only a lone guitarist on stage. A pause. One that engenders expectation. Builds suspense. No. It is because nobody remembered to book the cast. If a slightly obvious opening gag, it is the only element of predictability in the show. What follows is two hours of offbeat, off-centre, unconventional, way-out, high-spirited, hilarious entertainment that puts a smile on your face so wide it threatens to do permanent damage to your facial muscles. After the producers have acknowledged their error in forgetting to employ their actors, they take on the task of performing all the roles themselves. Louise Beresford, Severine Howell-Meri, Amanda Shodeko and Anna Spearpoint (the self-acclaimed only all-female panto team in London) take on all the stalwart characters, and more. It is controlled chaos; precise and extremely clever, but there is a joy in witnessing them teetering on the edge of losing that control. Which is the appeal too. These girls are clearly having so much fun it is thoroughly infectious. Beresford, Shodeko and Spearpoint handle most of the multi-rolling with some wonderfully bizarre interpretations and mashing up of the fairy tales. If Sondheim had dropped acid and hung out with ‘Monty Python’ he would have probably come up with this instead of ‘Into the Woods’. Howell-Meri plays the ‘hired musician’ who has wandered into the scenario with a bewildered expression, much like those celebrities who were unwittingly press-ganged into a Morecambe and Wise sketch show. There are so many wonderful homages to our unique strand of comedy that stretches back through the decades; from The Goons, through to The Comic Strip and French and Saunders, Wood and Walters; with elements of Reduced Shakespeare and the ‘Play That Goes Wrong’. Yet these four add a distinctive contemporary touch too and make it their own with their individualism and idiosyncratic energy. Carla Kingham’s direction keeps the fevered pace, challenging the stamina of the actors, not to mention the costume changes, with hilarious results. There is little point in supplying you with any hint of the narrative thread, except don’t be fooled by the title. Yes, it does centre on Cinderella and Jack (and the cow); and we do have the prince (though not as we know it) and the ugly sisters, but there’s also… oh, just pick your favourite panto character and they will be in there somewhere. Maybe not instantly recognisable but I defy anybody not to be in stitches at these portrayals. And if you’re one of those who would run a mile at the merest suggestion of ‘audience participation’; believe me, you’ll be singing along and holding hands with the stranger next to you long before interval. Cinderella and the Beanstalk is completely bonkers but probably the most fun you will have this Christmas. If you embrace the festive season this is definitely the show to catch. If you’re a Scrooge, disparagingly looking down on the ‘Panto’ artform over your horn-rimmed spectacles; then look again. This is also definitely the show for you – you will be converted. 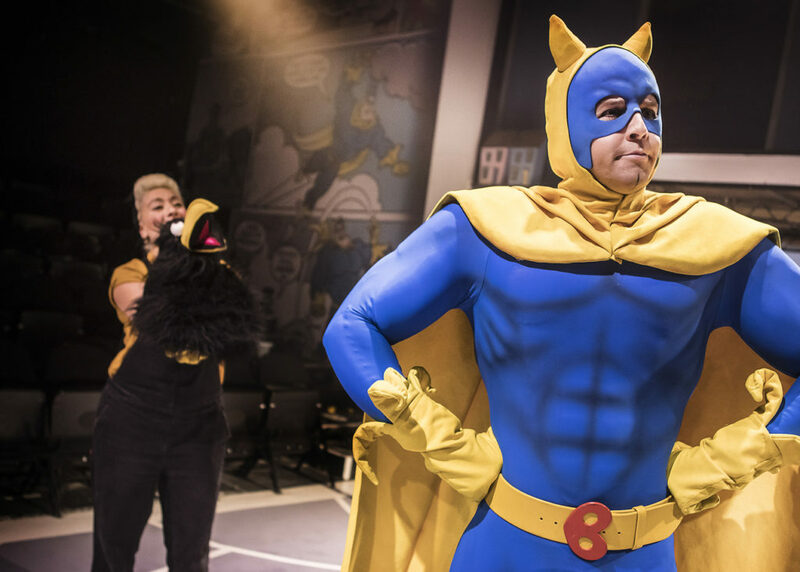 Having gone through the majority of my life knowing nothing of Bananaman, I was intrigued to learn more about this parody of a superhero and more importantly how a musical could be written about him. For the uninitiated he was introduced in February 1980 on the back cover of Nutty, a new DC Thompson produced comic. He was portrayed as a hero with the ‘muscles of twenty men though with the brains of twenty mussels’. Following the success of his comic book appearances a TV cartoon was commissioned featuring the high profile voices of The Goodies. The series finished in 1986 but today visitors to Beano.com can indulge themselves in trivia and the original videos. Bananaman continues to be a popular figure in Beano. Leon Parris has taken the original storyline and written the book, music and lyrics to this entertaining, yet bonkers production. Mark Perry directs what seems to be a cross between pantomime and a Footlights comedy show. Designer Mike Leopold has made the most of the Playhouse Large’s open space with a two level set surrounded by blown up Beano images. The atmosphere is cemented by TV theme tunes playing as the audience enters. The story explores Bananaman’s origins when weedy Eric Wimp gains super powers which in turn leads to a series of often comical misadventures along the way with (a talking) Crow, love interest Fiona and the bumbling Chief O’Reilly whilst all the time having to endure the awful food prepared by his loving mother. It’s a classic good over evil storyline with our hero attempting to defeat the villains Dr Gloom, General Blight and the Mad Magician. A fine cast has been assembled to get hold of the content and on my visit they brought laughter and cheer to a very responsive audience who rewarded the hard working team with a standing ovation. Mark Newnham (from All or Nothing and Sunny Afternoon) has a great voice and plays the part of Eric Wimp well and Emma Ralston is a terrific Fiona Mullins. Jodie Jacobs takes on the role of Crow bringing her strong singing voice to the fore whilst carrying out the difficult job of being the ventriloquist making Crow come to life. TJ Lloyd is a very funny Chief O’Reilly and Matthew McKenna is everything you’d want the square jawed and muscled Bananaman to be. Standout performances come from Marc Pickering as Dr Gloom and Carl Mullaney as the camp General Blight. Pickering is quite amazing and worth the price of the ticket alone. Disappointingly I found the sound to be rather muddled and often overpowered the singers to such an extent that at times it was difficult to hear the words that were being sung. The lighting was basic yet reasonably effective. Whilst I enjoyed the show I felt that the first half lacked the sense of fun and direction that the second half successfully delivered. I’m sure many Bananaman fans will fall in love with this production, though others may find it just a little too puerile to be really enjoyable and worthy of another star.